Micheal Martin certainly trampled on some politicians' presidential dreams this Ard Fheis weekend. 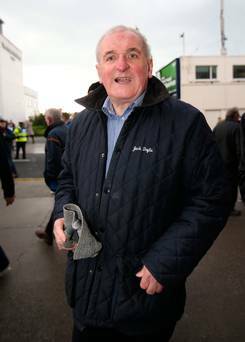 The chief casualty, Bertie Ahern, is not expected to survive. Gerry Adams has been badly bruised and President Higgins received a blow to the head that may be terminal. Even after he had to resign in 2012 from the Fianna Fail party he so loved and had controlled for so long, Ahern never stopped being a politician. He had had a torrid time that would have broken most people, not least becoming a national laughing stock as a result of tribunal appearances in 2007 and 2008 which showed an ex-Minister for Finance to have no convincing explanations of how he had acquired large sums of money. After his resignation as Taoiseach and leader of Fianna Fail in 2008, he to endure years of being assailed for his contribution to the economic crisis. He was defiant, complaining in 2009 about "cynics and knockers" and people who blamed everyone except themselves - a trait which he seems never to recognise he has in abundance. He kept his spirits and his bank balance up by making speeches abroad about his achievements in the Northern Ireland peace process, yet the attacks on his integrity and competence would not go away, so in 2010 he announced he would not be running in the general election and avoided being part of the slaughter of Fianna Fail. The worst disgrace came in 2012 when the tribunal accused him of being untruthful about how he had acquired in the region of 250,000 Irish punts. A man who had lived and breathed Fianna Fail from the age of 14, when he climbed lampposts in Drumcondra to hang election posters, now faced expulsion. The new leader, Micheal Martin, who had inherited this sorry mess, accused Ahern of a betrayal of trust, saying the tribunal's findings "constituted conduct unbecoming a member of Fianna Fail" and proposing a motion to expel him. True to form, Ahern claimed he had done nothing wrong and "a grave injustice" had been done to him, but he announced his resignation as a party member as this was the best way to continue to "serve Fianna Fail". He was down for a time, but he wasn't out. Circumstances have given him the chance to recast himself as an elder statesman, giving evidence last year, for instance, to a House of Lords select committee on the likely effects of Brexit on Ireland, the peace process and Anglo-Irish relations. His supporters have grown hopeful. In her Queen of the Ploughing, the redoubtable Anna May McHugh said Ahern "would make a fine president if he decided to run". In a recent discussion about this, she added, "someone said he couldn't run because he had dirtied his bib. 'And couldn't we wash it?' I said jokingly." The remnants of what used to be known as Ahern's Drumcondra Mafia are certainly intent on washing that bib, with his old O'Donovan Rossa cumann asking that he be reinstated as a party member and given a "distinguished service medal". Martin saw off this "mischievous" letter uncompromisingly. He had not changed his position on Ahern returning, and as for an award: "Those of us, including Bertie, who have had the honour of serving in high office, that's our reward." Ahern and his supporters will have factored in that it would be propitious that 2018 is the 20th anniversary of the Good Friday Agreement. So too, of course, will have Gerry Adams, who must be contemplating running for the president as a peacemaker. Micheal Martin has no intention of making it easy for him either. There was no ambiguity in his rejection of the notion of Fianna Fail legitimising Sinn Fein by going into coalition with it - a party whose treatment of its members is "unbelievable… And not healthy in terms of the democratic system we have". No more than President Higgins, Taoiseach Varadkar or, indeed, a majority of voters, does Micheal Martin want the distraction of a presidential election, but there's too much agitation from the grassroots to rule it out. He has challenged Higgins's crafty decision to keep quiet about his plans until September next year in the hope of dissuading potential candidates from standing, by committing himself to considering options early in 2018. Three on the ropes. Who's next?